A drama focused on a normal family living in London. When Jax (Nadine Marshall) discovers she’s unexpectedly pregnant, it causes a strain on her family as her husband Mark (Idris Elba) doubts her faithfulness. 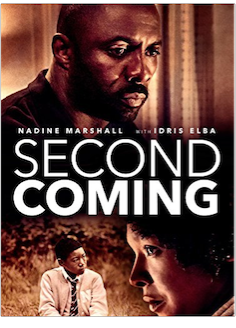 Second Coming is a family drama with some magical realism elements as Jax struggles to cope with her life and the situation she finds herself in. She doesn’t always trust her own mind and finds herself snapping at her young son JJ (Kai Francis Lewis). Second Coming is a bit slow and it relies heavily on the characters so it won’t be for everyone but at least the actors all give wonderful performances. Young actor Kai Francis Lewis give a brilliant performance who is just a normal boy who daydreams in class and is fascinated by birds. You could say there’s metaphors in the scenes with JJ and a black bird if you really want to look into things. The script is pretty great as all the conversations between various members of the family feel natural, both the arguments and the stilted conversations across the dinner table. That being said, Second Coming is moody and atmospheric and a very slow drama that has few major moments of conflict. Second Coming is a slow, thoughtful drama that won’t be for everyone but it does have some great performances. 3/5.